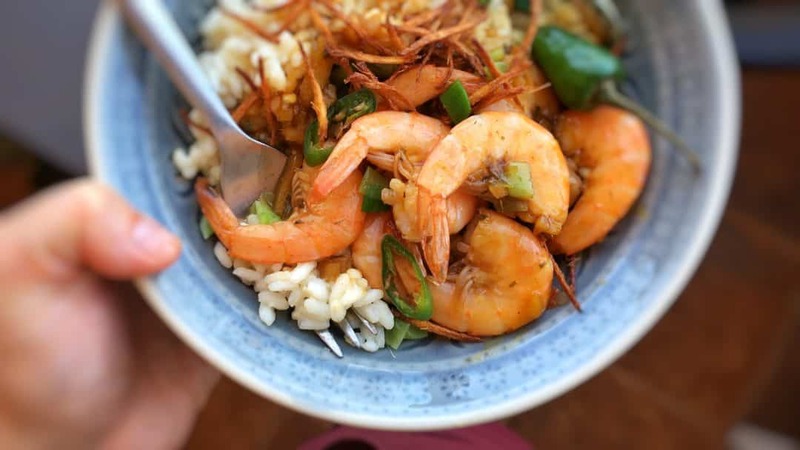 Sauteed Shrimp with Ginger & Rice | Simple. Tasty. Good. Roll up your sleeves because we’re cooking 3 versions of sauteed shrimp today! 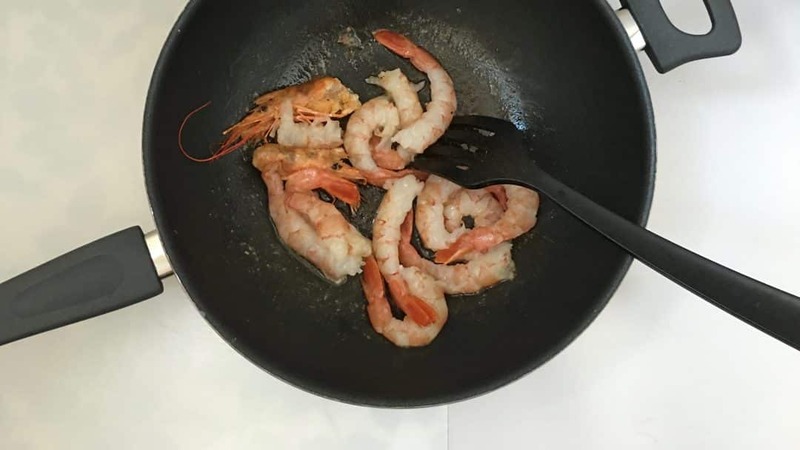 I don’t like eating shrimp with a knife and fork (at home that is) so I stopped making a mess of the shrimp, my plate and most of all my clothes. I have 5 forks and knives on each hand so why bother? Prawns and crustaceans in general are exciting finger food. Delish! Tear down those shells and munch away. You can also use peeled shrimp of course. But I like them best with theirs shells on. It’s up to you. I sometimes like to fry some freshly sliced ginger and use it as a crunchy topping for the sauteed shrimp. 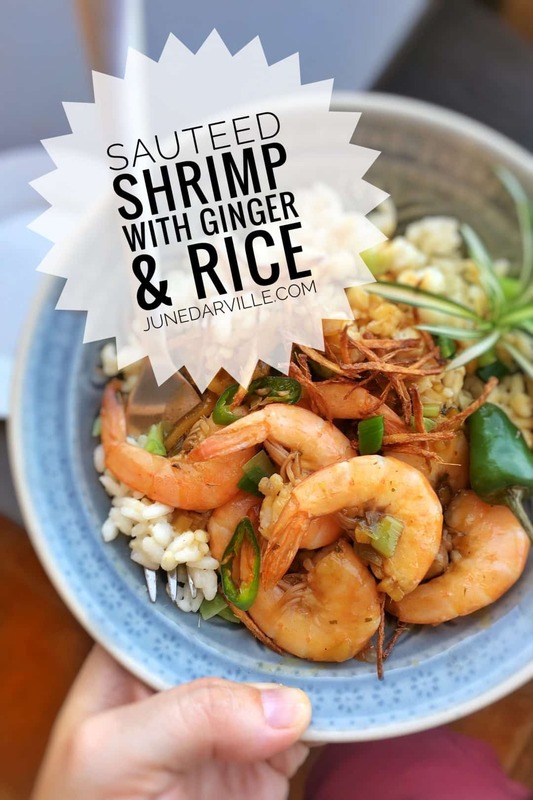 Fond of sauteed shrimp and rice? Then also take a quick look at my dirty shrimp with rice and liver! 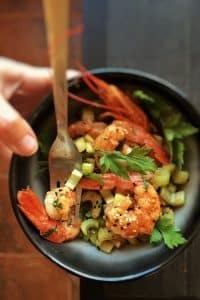 Or scroll down to the 2 other sauteed shrimp recipes below: one with fennel and one with celery and Old Bay seasoning. 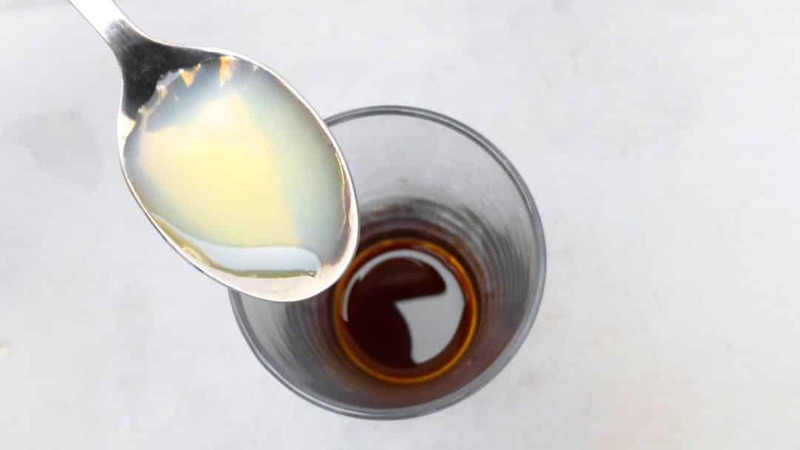 Combine the lemon juice, fish sauce, oyster sauce and soy sauce in a small cup or glass. Add 2 tablespoons of cold water. Whisk well and put this marinade aside until needed later on. Pour the vegetable oil in a large non-stick pan and place it over medium heat until hot. Then add the garlic paste and sliced ginger. Stir fry them for a minute and then add the prawns to the pan. Stir fry the shrimp for a couple of minutes until they are pink and cooked through. Then add the soy sauce marinade and season with some pepper. Stir the shrimp for another 2 minutes. Take the pan off the heat and check the seasoning. Add extra pepper, soy sauce, lemon juice, oyster sauce or fish sauce to taste. Stir in some chopped mint, cilantro or spring onion. Divide the sauteed shrimp over plates and serve with boiled rice. Some flavor ideas and combos just hit home in my head because I just know it will taste exactly the same in real. Sauteed shrimp and celery for instance, simple ingredients. But put them together and it’s like fireworks. 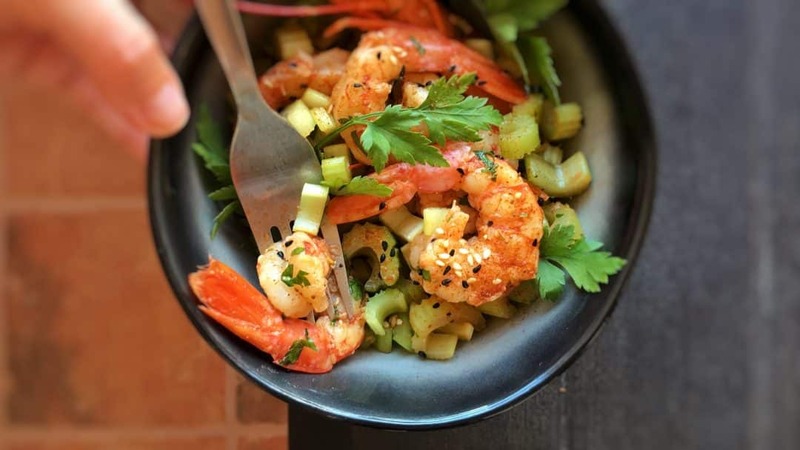 I love the texture contrast for a start: the soft sauteed shrimp next to the crunchy stir fried celery. The scent of white wine, Old Bay Seasoning and browned butter is another delight. I added the shrimp heads because they also add a richer shrimp flavor to this dish. Love that Old Bay Seasoning by the way, especially in combination with seafood. You too? Then also check out my stone crabs with Old Bay Seasoning and cilantro butter! Epic. Peel the shrimp, keep the tails on if you like. 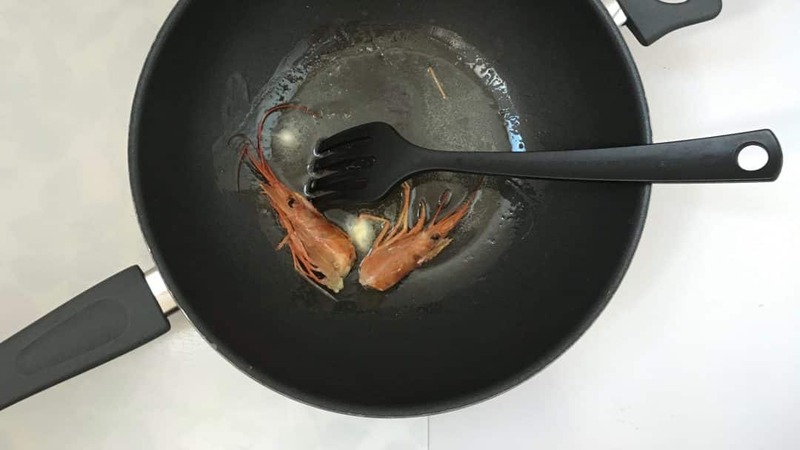 Keep 2 shrimp heads aside for this recipe (you can turn the remaining heads and scales into a delicious prawn head soup). Add half of the butter to a large wok and place it over medium heat until melted. Then add the 2 shrimp heads. Stir fry them for 2 minutes. Season with a pinch of garlic powder, pepper and Old Bay Seasoning. Then also add the peeled shrimp to the hot wok. Stir fry the shrimp for 4 to 5 minutes until they are pink. Then add the celery and white wine. Sautée the ingredients for another 2 minutes. Then take the wok off the heat. Add the sesame seeds and remaining butter. Stir the prawns well. Check the seasoning and add extra pepper, Old Bay Seasoning, salt or garlic powder to taste. Remove the shrimp heads. 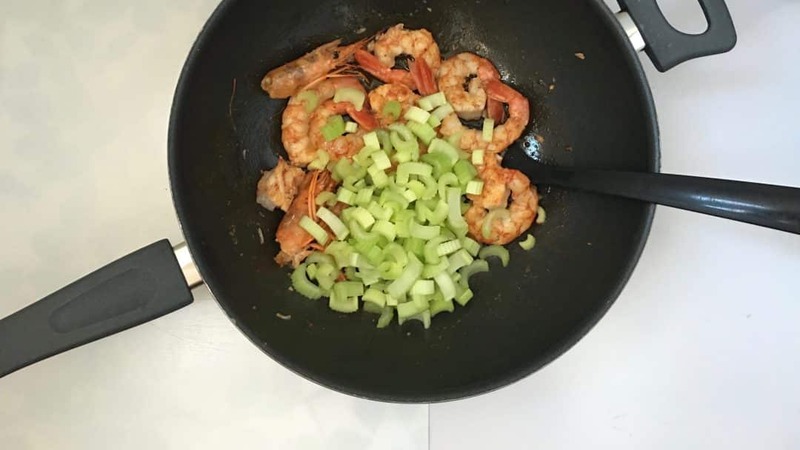 Divide the sauteed shrimp and celery between plates. Serve hot. 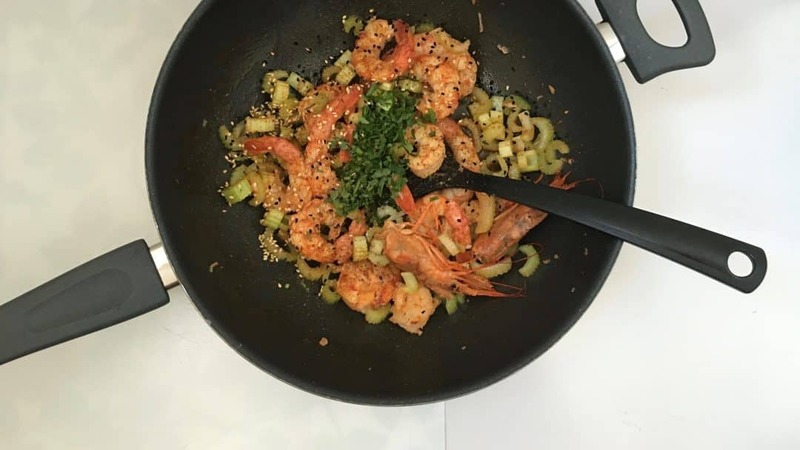 Next up then: a healthy stir fry of sauteed shrimp and fennel. Perfect match again. 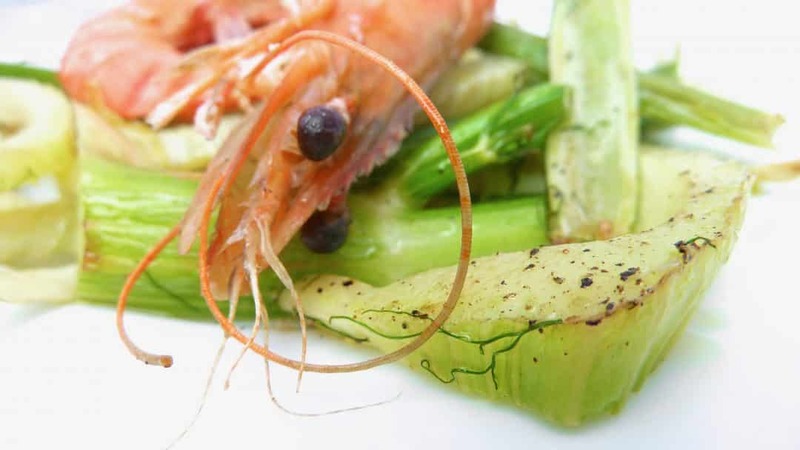 The sweet flavor of the juicy shrimp in combination with the lightly caramelized fresh fennel is close to perfection. Pure and simple. That’s why this time I didn’t bother adding lemon juice, garlic or fresh herbs in the end. Less is more. I usually prepare sauteed shrimp on my teppanyaki hot plate outside when the weather is fine in the evenings. 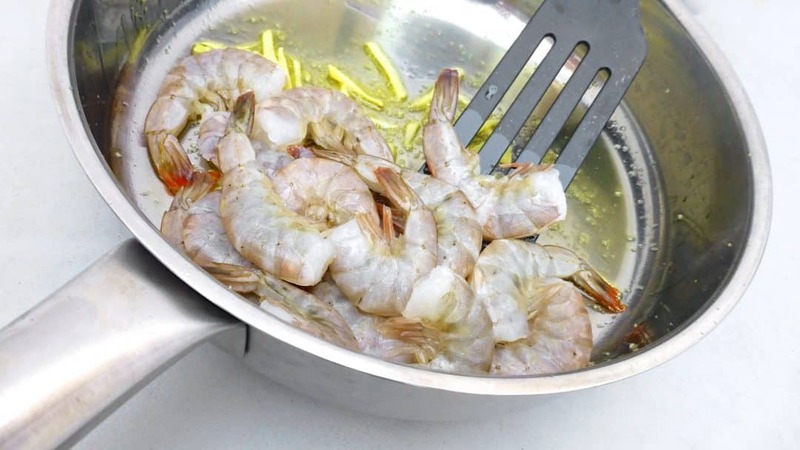 But when my outdoor cooking plans fail I prepare these sauteed shrimp in a large wok. If you can, go for shrimp with heads still on. You will see that it contains a lot of juice that transforms the remaining olive oil into a rich ‘sauce’. 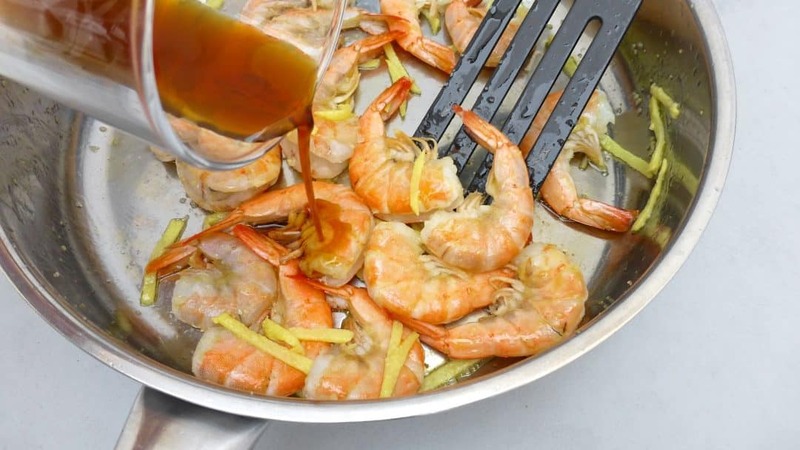 Drizzle that on top of the sauteed shrimp and fennel or mop it up with a piece of bread in the end. De-lish. Next up then: a healthy stir fry of sauteed shrimp and fennel. Perfect match again. Rinse the (thawed) shrimp under cold running tap water and let them drain on some paper towels. Trim the fennel bulb. Slice it up lengthwise and chop the slices roughly. Pour a little olive oil in a wok and place it over medium heat until hot. Then add the chopped fennel and stir fry it for about 4 minutes. Season with a little pepper and salt. Add the shrimp when the fennel starts to brown lightly. Stir fry for another 3 minutes until the prawns are pink. Then turn off the heat. Check the seasoning of the sauteed shrimp and add extra pepper or salt to taste. 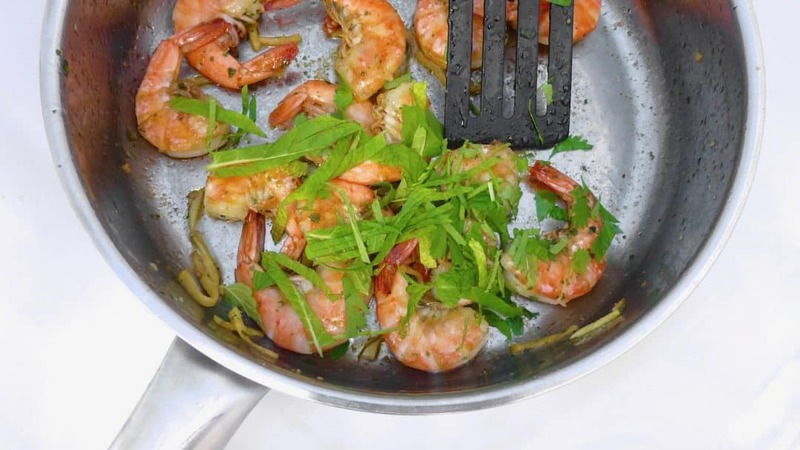 Transfer the sauteed shrimp and fennel onto plates. Drizzle with the remaining oil. Serve immediately. Super cool all around! Love the fried ginger and all the technique you used on this one.